History – Kingery Construction Co. In 1884, William Henry Kingery arrived in Lincoln, Neb. after a long journey from southeast Iowa. He sought work at various planning mills in Lincoln and quickly gained experience and knowledge within the construction industry. In the early 1900s, William and a business partner started the Enterprise Planning Mill. Years later, William purchased his partner’s share of the business and William’s son Everett Kingery joined the company. 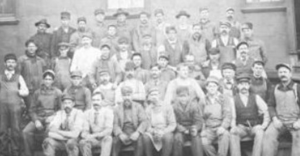 Enterprise provided mill work throughout the state of Nebraska. On April 7, 1924, a fire broke out at the mill. With only a few shovels, a wheelbarrow and a flatbed truck, William and Everett decided to pick up the pieces and start a construction company. In 1924, the father-son duo established Kingery Construction Co. The company built several public school and university projects in the 1920s. The relationships formed throughout those projects led to many more education projects throughout the next century. Kingery Construction Co. continued to expand, adding numerous Public Works Administration projects in the 1930s. Everett’s son Orville Kingery returned from the Navy in January 1946 and began estimating and bidding. Orville’s brother-in-law Harvey Hales also joined the family business in 1946 after serving in the Air Force. Harvey worked in the field, eventually earning a promotion to superintendent. In the early 1950s, Orville’s younger brother Wayne Kingery joined Orville in managing the company. Wayne had recently graduated from the University of Nebraska after serving in the Army during World War II. Throughout the 1960s, Kingery Construction Co. widened its focus by constructing churches, hospitals, commercial projects and private design-build projects. Orville and Wayne ensured that the philosophy of their business was known to all employees – always work hard with character and integrity. Today, former accountant Rod Berens is the President of Kingery Construction Co. Our company is one of the top commercial contractors in Lincoln, Neb., specializing in educational, religious, financial, healthcare and office building projects. Kingery Construction Co. offers services in general contracting, construction management and design-build. The Kingery Construction Co. team provides extraordinary vision and commitment to the company and its clients. We are dedicated to making every project successful and enjoyable for all parties. Over the past 92 years, Kingery Construction Co. has focused on providing quality service and exceptional team members to every project. We know what it takes to meet client expectations for excellent work and responsiveness. We have developed relationships with respected architects and owners in eastern Nebraska and the Lincoln area. We have completed jobs of all shapes, sizes and complexities. From the Lied Center for Performing Arts to Bryan Health to the Student Union at the University of Nebraska-Lincoln, Kingery Construction Co. is proud of the benefits our buildings offer the community.